FULTON – A hand-painted mural, created by the Oswego County AmeriCorps program and children taking part in activities at this year’s Oswego Harborfest, now brightens a wall at Michaud Residential Health Services in Fulton. From left are: Oswego AmeriCorps member Elyse Cianfrano with her grandmother, Betty Cianfrano, a resident at Michaud Residential Health Services in Fulton. The pair is seen next to a hand-painted mural that AmeriCorps members including Cinafrano helped create, with the help of a number of young artists who took part in activities at this year’s Harborfest’s Children’s Park. 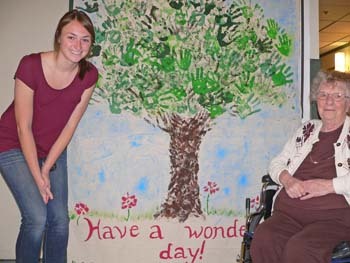 The mural was donated to Michaud residents for their enjoyment and is on display in the residence. The mural was painted during events at Harborfest’s Children’s Park. So many “hands” took part in its creation! In turn, the mural was gifted to the residents of Michaud as a way to brighten their days, and is now a fixture in the residence.